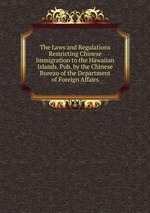 Аннотация к книге "The Laws and Regulations Restricting Chinese Immigration to the Hawaiian Islands. Pub. by the Chinese Bureau of the Department of Foreign Affairs"